Matheny School teachers Tina Carey, left, and Karen Deland, right, presented The Friends of Matheny president Liz Geraghty with a poster expressing the school’s appreciation for everything the group has done. The Friends of Matheny is an organization of volunteers dedicated to providing support for Matheny’s students and patients. Since its beginnings in 1983, The Friends has raised more than $3 million to help sustain Matheny’s programs and services. At a recent informal reception in the Matheny staff dining room, to mark The Friends’ 30th anniversary, Matheny employees thanked several members of The Friends for everything the group has done. 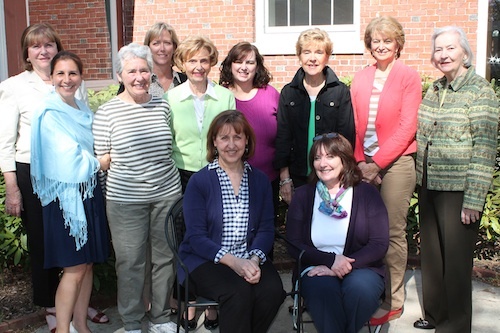 The Friends’ gifts through the years have ranged from the purchase of adaptive and therapeutic equipment and technology for The Matheny’s School’s classrooms to the renovation of our main lobby and the furnishing of a special family dining room. 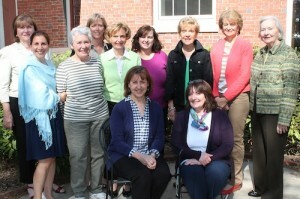 Some of The Friends who attended the ‘thank you’ reception: Standing, from left, Karen Thompson, Edana Desatnick, Linda Horton, Kathy Sisto, Dorothy Carter, Colleen Blaxill, Nancy Hojnacki, Helen Fallone and Jean Wadsworth; seated, Liz Geraghty, left, and Gail Cunningham, Matheny coordinator of volunteer activities. This entry was posted in Uncategorized and tagged Friends of Matheny. Bookmark the permalink.